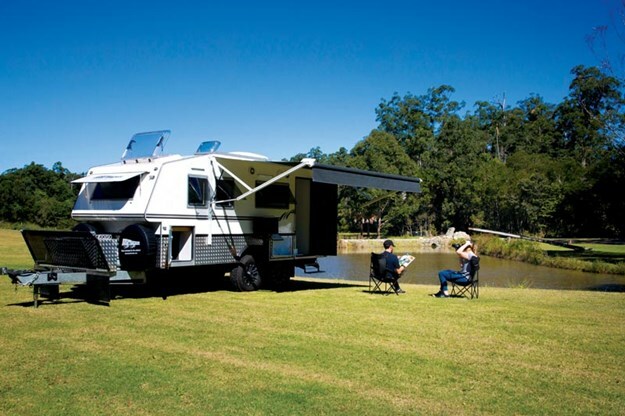 There is no doubt that there are any number of offroad caravans on the road around Australia. Or at least many labelled as offroad — those which have a beefed-up and raised chassis along with a fully independent suspension. However, it’s in the body work where much counts for the rough outback tracks and therefore, the overall structure matters. 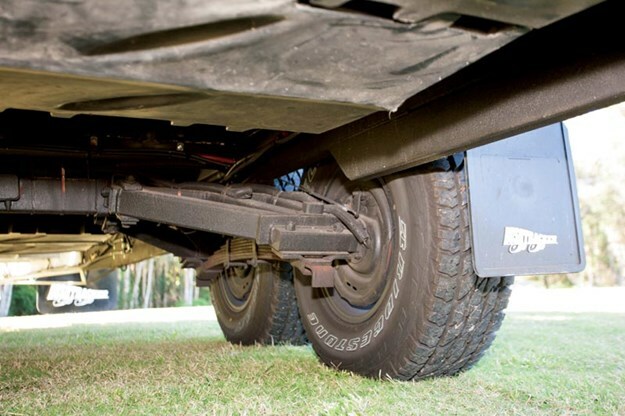 It’s no coincidence that there are quite a few specialist offroad caravan manufacturers in South East Queensland and one of those is the well-established Bushtracker, a company that has created something of a reputation for itself. Because of the nature of offroad caravans, Bushtracker has a name for building large and heavy caravans as it does for good reason. But the manufacturer also builds smaller vans which, in many ways, are better suited to heavily undulated tracks. One such example is the 18ft tandem-axle unit. Because many Bushtrackers are custom designed, the vans don’t have model names as such, just the imperial reference. A feature of note is the 2.17m (7ft 1in) external width. Slimmer than most vans, it’s much more versatile when negotiating narrow bush tracks. Custom made or not, the van has the same basic structure as any Bushtracker van, with a hot-dipped galvanised chassis, an aluminium frame and fibreglass cladding. There is plenty of steel in the chassis, it has dual 150mmx50mm (6inx2in) rails and a steel sub frame with cross members. That supports the resin-infused composite floor that is bonded to it. A peek under the van looks like it has all been painted black but that is actually a sprayed-on body deadener which acts as a water and dust sealer. A little unusually, the Bushtracker rides on Simplicity independent, load-sharing tandem-axle suspension. It uses trailing arms and an inverted leaf spring, rather than coils. This is a tried-and-trusted arrangement for Bushtracker and comes shod with 16in alloy wheels. Above the chassis, an aluminium frame is fully welded and double structurally welded. It's built box-section style and has a minimum of 2mm thickness with 5mm overlapping sections in joint areas. Although stucco-coated aluminium is frequently used for an exterior cladding, there’s a smooth white fibreglass available as an upgrade. Between the inner and outer walls cooler board insulation is used. One thing about the body shape, it is quite distinctive with the small overhang at the front and large departure angle at the rear ­— so no scraping the rear end over steep drops or risers. Other trademark features are the water sealing door across the entry door – I don’t know of anyone else in the caravan industry who does that — and the large front tunnel boot, almost the same size as some of the ‘garages’ seen in European motorhomes. Undoubtedly, the drawbar is a very multifunctional place with the expected features such as the Hitch-Ezy coupling and stainless steel handbrake along with two 9kg gas cylinders and two spare wheels. A large checkerplate storage box includes a generator slide-out tray, and a firewood collector is quite prominent. Less so is the diesel heater fuel tank for the Webasto space heater. There’s a fair bit of extra capacity load on the drawbar, consequently doing a weight check might be a good precaution. 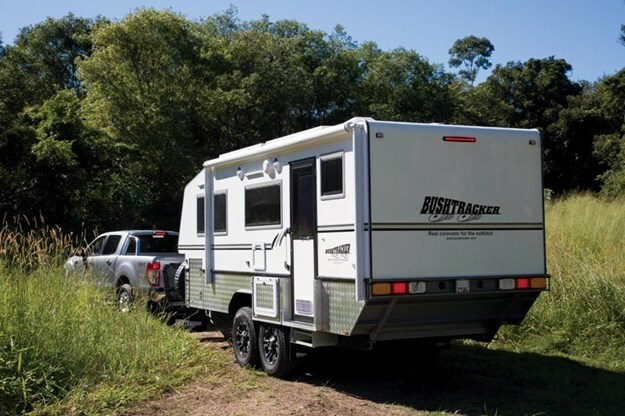 Offroad travel also means living remotely and the Bushtracker 18ft is very well equipped. Three 75L tanks supply the fresh water and a 300Ah lithium battery supplies the electrical load. The battery is backed up by 450W of solar panel capacity, a 30A DC to DC charger and a 60A mains charger. On the other side of the power equation, LED lighting, a Danfoss compressor fridge and 12V Sirocco fans keep the power consumption to a minimum. Bushtracker has a couple of interior design themes: one has a Tasmanian oak finish and the other, which this van has, is aptly named ‘modern choices’. The result is a light and bright look, even in a fairly compact interior. Actually, Bushtracker is quite good at being compact in this front island bed, full-width rear bathroom layout. Something that catches the eye is the high island bed, mostly because of the tunnel storage underneath. Raised platforms on both sides allow easy access, those same steps being good to use for underfloor storage. 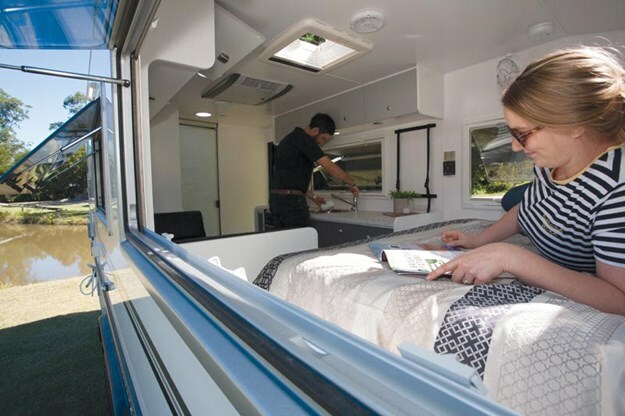 The raised bed also allows for three drawers to be installed on one side and a front-loading washing machine, something normally found in the bathroom, on the other. Lifting bed bases gives access to most of the 12V electrical essentials, such as the battery charger and 12V fuses. Wardrobes and bedside cabinets with a good shelf area are fitted on either side of the bed and both sides have 240V and 5V USB power sockets. A neat touch is that the USB slots are integrated into the powerpoints, not requiring a second fitting. On the nearside, split windows accommodate the awning arm on the outside. Two people can easily sit at the cafe-style dinette. It too has been designed with compact design in mind. A pole-mounted table can be moved out of the way when not required, leaving a small cabinet just for drinks and nibblies. Both seats have drawers for under-cushion storage and, just for an added attraction, the front seat also has a subwoofer for the sound system. Space is fairly limited for the kitchen bench area but it’s still quite a practical setup with the usual features ­— four-burner cooker/grill/oven, a round stainless steel sink and plenty of drawer and cupboard space. There is a window behind the bench and the remaining area is used for a flatscreen TV mounting point. A couple of straps give a much more secure mount than just a swivel arm. Between the dinette and bathroom is where the 220L fridge is mounted. 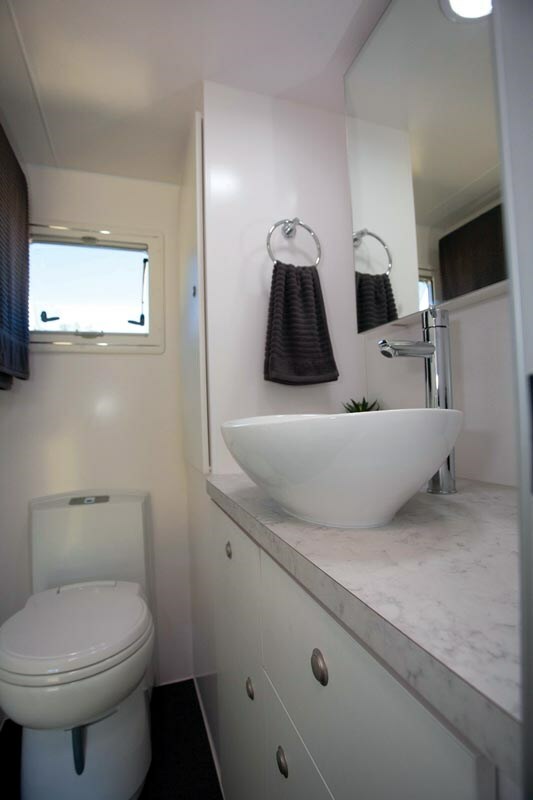 External bin doors aren’t usually found inside caravans but there’s one in the shower cubicle of this bathroom to create a shelved but waterproof cupboard. It’s handy for stashing soap and shampoo when travelling along. More conventional in the bathroom is the Thetford cassette toilet and a good-sized vanity cabinet with cupboard and drawer space. Like the rest of the caravan, the cupboards have positive-locking marine grade catches and the drawers are all fitted with ball bearing runners. Weight figures are definitely interesting. An ATM of 3500kg and a Tare mass of 2640kg mean a substantial payload capacity of 860kg. Fully loaded means at least a Toyota LandCruiser or similar vehicle. However, even with less than full load on board, I reckon for the serious offroader a substantial tow vehicle would be a good idea. 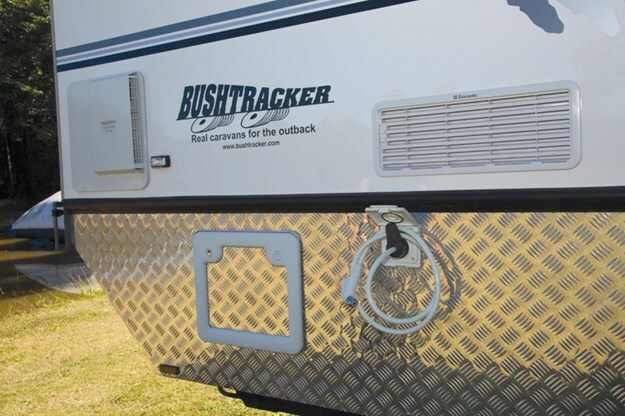 Bushtracker caravans don’t come cheap, but this one does have a starting price of $107,500 and a considerable number of custom fittings. 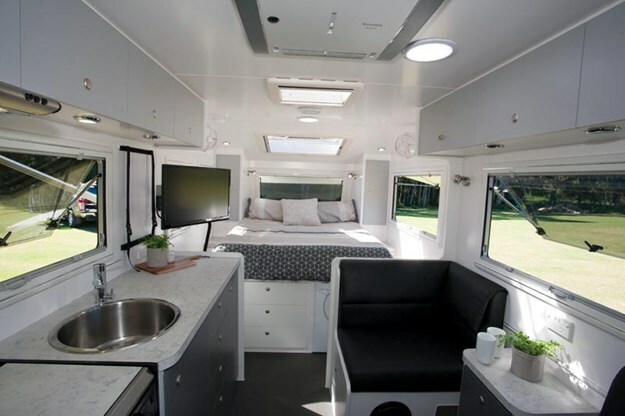 It’s also an ideal van for the offroad traveller who really desires all the modern caravan comforts but wants a van that isn’t too much work to handle, both on-road and offroad. The full feature appeared in Caravan World #579. Subscribe today for the latest caravan reviews and news every month!